This trip was taken in July 2009 with our good friends Bob and Allie and our always willing and ready “Canoedog” - Lily. Our friends Bill and Marg unfortunately were unable to make the trip but there’s always next year! We wanted to do a trip that allowed us to use the Budd Car rail service from Sudbury to travel both to and from the route. We used the Budd Car service from Sudbury to Biscotasing where we started our trip. The train left Sudbury approx. 1 hr. late due to a summer maintenance program on the tracks. 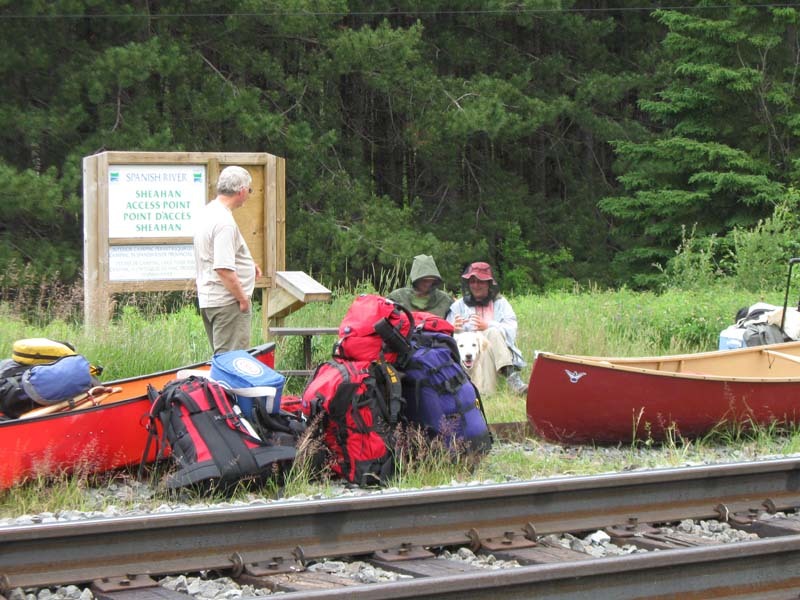 Train was very busy with 2 coach cars plus the baggage car and many canoeists using the service this weekend boarding in both Sudbury and Cartier. Other than our group, the rest of the canoeists were doing Spanish River trips – one group from The Forks and the remainder doing the west branch of the Spanish from Biscotasing. The train arrived in Biscotasing about 2 hr. later than normal. We launched along with the group doing the west branch from the general store beach and parted ways shortly after – the other group heading northeast for the Spanish and us heading south down Biscotasing Lake. It was a cool and showery day and as usual the wind was up and in our faces! Due to the lateness of the start and the weather we decided to stay our first night on Biscotasing Lake in a sheltered area before we hit the larger open area to the south. The campsite was freshly cleaned and a new thunderbox installed by Parks Ontario staff. Day 2 started out overcast with a southerly breeze, after a leisurely breakfast we packed up and were on our way south to Indian Lake. After a brisk paddle we arrived at our one and only portage of the day into Indian lake – you have 2 choices walk the portage about 200 metres or use the marine railway that the locals use to transport heavier boats back and forth. We decided to use the railway more for the novelty as it’s probably just as quick to use the portage if canoeing. We headed south on Indian Lake stopping to have lunch in the boats along the way and the skies cleared. We headed down to the central portion of Indian Lake or the “hub” area and checked out several different campsites before settling on an island site near the east shore of the lake. It was a gorgeous evening and we again set up the bug tent and watched the sunset with a wee dram. Distance traveled – 18.5 km Portages – 1 – 200 m.
The day began with clear skies with a few cumulus cloud build-ups to the west. After another leisurely breakfast (beginning to detect a pattern here!) we packed and headed south for Mozhabong Lake. We reached the portage out of Indian Lake into Mozhabong Lake around lunch time – there is dam used to control water levels here and there are 2 portages – 1 on the right is short and steep (25 m.) and one on the left with 2 possible take outs at approx. 200 – 250 m. If water levels are high or low it is probably easier to use the ports on the left, as the port on the right is right at the base of the dam. After lunch on the Mozhabong side of the dam we headed off again. The area above the dam would be a meandering run through a swampy area if the water was low but with this years high water we could cut corners and not worry about the channel. You head south then southeast though a long bay before you enter the large portion of the lake and we then turned south towards some possible campsites in the middle portion of the lake. Unfortunately the sites are heavily used by folks and are at best dirty with broken glass in the fire pits and cans, old furniture and bbq’s all left behind – seems to me if you can pack it in – you can certainly pack it out. We spent an hour and cleaned up a site as best we could before setting up tents and the bug shelter and settling in for the evening. Distance traveled – 21 km Portages – 1 – 200 m.
It’s another beautiful morning and as per what turned out to be the normal morning routine we were again on the water around 9:30 am heading south. The winds were up this morning and we had to deal with a 20 km headwind whenever we couldn’t hide behind the islands and mainland as we made our way south. After crossing the large open area of the lake’s southern end, we headed into the bay on the southeast corner of the lake and paddled our way to our first multiple portage day. The narrow bay peters out into a small creek that enters from the south, we had to lift over a small rocky constriction into a small pond area covered in water lily’s – quite a pretty area. With the high water levels we were able to paddle right up to the beginning of the portage on the left of the creek entering the pond rather than wade through the last bit although I understand the bottom is solid! The portage runs along an rocky ridge for about 400 m. before heading down the hill to another pond area, we paddled about halfway down the pond and had lunch in the boats again, to stay out of the flies and mosquitoes – the wind was up and we drifted almost all the way back to our starting point. The portage from this small pond to Dusty Lake crosses through a swampy area that in drier years would be certainly an easier slog than we had – with this summers abundant and regular rainfalls the swamp was wet walking from one side to the other! You begin the portage on the right side of the swampy area and head easterly trying to follow the trail – we had to deviate through many areas, as the trail was wet and full of muddy areas, which you don’t want to step into! You cross a small rock outcrop about halfway across the portage but again you head down and through the bog till you reach Dusty Lake. This ended up being the hottest day of the trip with the most bugs just to make this small piece of northern Ontario a wee bit of hell! In drier conditions this portage although challenging would not be nearly as trying. With everyone fairly spent, we paddled around the main portion of Dusty Lake looking for a campsite. There is a large site on the south end of the large island but there was a mess with trash and building materials so we opted for a rustic site on the small island off the northwest end of the large island. Distance traveled – 14.5 km Portages – 2 – 1100 m.
We awoke to a blanket of fog covering the lake in the morning, which soon burned off with the promise of another beautiful day ahead of us. After a quick paddle to the south end of Dusty we managed to paddle and drag the boats through a narrow rock filled channel into a small pond, which leads to the portage into Landry Lake. Unfortunately the sun disappeared behind an overcast sky but the bugs didn’t leave! The portage was marked by a couple of overturned boats cached on the shore and again with the wet year there was a wet area to traverse in the first 100 m. or so of the portage which is about 300 m. long. Once in Landry lake we headed north for about a 1 km paddle to an old bridge which you portage around for the short distance of 40 m. or so into Sinaminda Lake. We then headed in a northeasterly direction on Sinaminda stopping for a lunch break in the boats again. Once we entered the main southern basin of the lake we passed 4 groups of fishermen who access the lake from the dam at the southeast corner of the lake. The next portage is along the east shore into Gilden Lake and you need to take the trail at the more northerly takeout to avoid some blow down etc. across the old trail. The portage is about 1 km long and is in good shape. The sun reappeared as the clouds cleared away and we headed off down Gilden Lake to the portage into Dennie Lake. The portage is well marked with a couple of cached boats on the shoreline and is also in good shape and about 350 m. long. Dennie Lake has a cabin on the northeast corner of the lake and it was in use as we passed by on the way to our last portage of the day into Little Pogamasing Lake. The take out was a bit tricky as it is rocky and with a stiff breeze blowing from behind us it made for a bumpy landing. The portage into Little Pogamasing is also in good shape and about 500 m. long however with the rainy season we had to slog through about 40 m. of water to get to the canoeable water at the end of it! We headed north on Little Pogamasing and camped at a site on the west shore about 1.75 km from the portage. The camp is up on a small rock point and had a downed tree crossing it however there was room for 2 tents in the bush behind and room out front for a fire and the bug tent. Distance traveled – 20 km Portages – 5 - 2200 m.
We awoke to partly cloudy sky that promised of some rain to come later in the day but we held to our routine and managed to get away by about 9:30 or 10:00 again! We headed north on the lake for the Pogamasing River, which is the route out of Little Poggamasing to Pogamasing Lake. The river is actually more creek like in nature than a river but there is always sufficient water to paddle through however there are numerous lift over’s and portages to deal with along the way – 7 to be exact at the water levels we encountered but that could be more or less pending time of year and the water levels. The first small obstacle was about 30 m. in length and there was sufficient water and enough suitable rocks on the shore that we lined the canoes down and carried on for about 500 m.
The next obstacle was a short stretch of rapids without a suitable opportunity to line the canoes so we ended up portaging across the rocks for about 50 m.
After another short paddle of about 800 m. we ran into a shallow rapid – we managed to bump along for a bit then took out river left for about a 250 m. portage to another pond area of the river. We stopped for lunch here as the bugs weren’t too bad. After another quick paddle we portaged about 40 m. around an old logging dam before another short portage of about 20 m. around another small rapid/waterfall. As we set out again we paddled through a brief downpour to a very rocky and tricky takeout to the next portage to Pejeke Lake of 700 m. The portage splits about 30 m. along the way, stay left and it brings you around a series of rapids to Pejeke Lake. The trail was fairly overgrown in some spots and the rain made the footing somewhat adventurous in spots. After the portage you have the longest paddle of this stretch – about 2 km to the last portage into Pogamasing Lake. This portage is about 600 m. long and had been cleared of deadfall by someone with a chainsaw just that day. By the time we finished the portage the sun had reappeared the skies had cleared and the wind had come up. We headed out into Pogamasing Lk hoping to head north to an island campsite but there were 2 foot high waves out of the southwest so we opted to head straight across the lake and camped for the evening on a great beach on the east shore of the lake. A day of short distance traveled but with a lot of stop and go due to all the portaging but an enjoyable day due to the variety of terrain, water and scenery. Distance traveled – 10 km Portages – 7 – 1700 m.
Well it was our last day and as we only had to travel to the train stop at Sheahan, it was an even more relaxed morning than had been the norm for this trip! We packed and hit the water at about 11:00 heading for the portage to the Spanish River – a 2 km paddle and an 800 m. portage along a road to the river took about 1.5 hr. With plenty of time we had lunch on the east bank of the river before carrying the gear up to the tracks. As usual with the Budd Car it was somewhat late but other than a brief rain shower and dealing with the black flies and mosquitoes it was a pleasant enough afternoon. A list for "next time"
Total trip distance – 92 km Total portages - 16 – 6200 m.
“This trip was planned using a trip report and maps from Erhard Kraus' website and who has canoed extensively in the area." 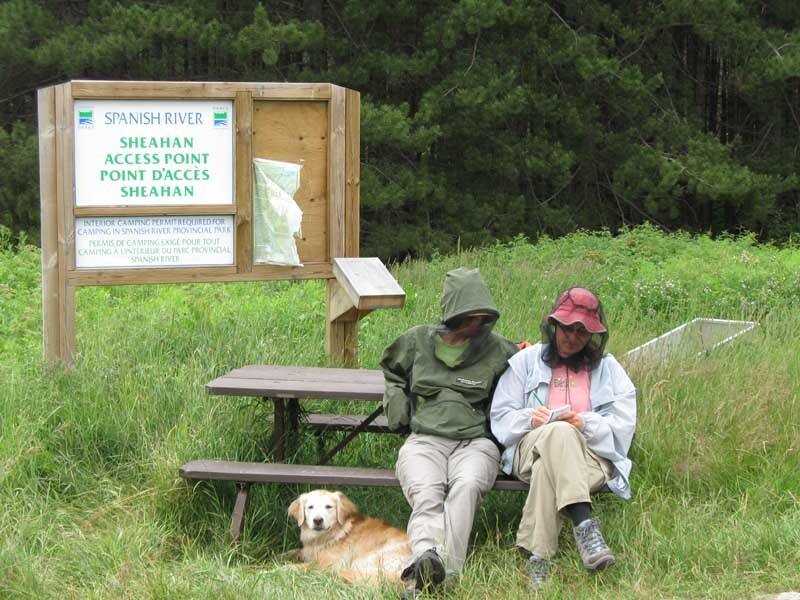 See the links for further information on portage and possible campsite locations etc.